African violets are so popular that people all over the world have started large collections of these colorful, flowering houseplants. 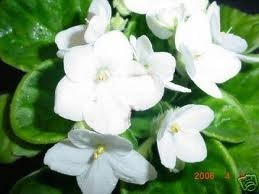 Available in many colors, leaf shapes and sizes, African violets are a hobby in and of themselves. One popular method of providing a regular source of water for African violets is through wicking. Wicking takes the guesswork out of watering. 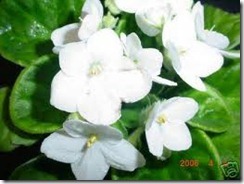 It also makes the chore of watering a large number of African violet plants easier and more consistent. If you are away from home for days at a time or just forget to water the plants occasionally, wicking is a useful way to insure that your African violets have enough water when they need it but not so much that their roots suffer. Measure the height of the pot in which you want to set up a wicking system. Cut three lengths of twine double the height of the pot. Tie one end of the twine securely to a chopstick or knitting needle. Water the African violet thoroughly in order to loosen the soil. Insert the secured end of the chopstick into the soil and use it like a needle, threading it through the pot. Install each wick through the root ball of the plant, and out of the drainage hole in the bottom of the pot. Space the wicks evenly around the pot within the root ball, not along the outer sides of the pot. Trim the wicks to allow 2 inches of twine to extend out of the bottom of the pot. Place the pot in the plant saucer so that the ends of all three wicks are on the bottom of the saucer. Fill the saucer with pebbles or marbles to a depth of 1 to 1-1/2 inches, burying the wicks. Put the African violet plant in its final location and fill the saucer with water to a point just below the top of the pebbles or marbles. The saucer is now a water reservoir that will feed a steady stream of water to the roots of the African violet plant through the wicks. As the soil in the pot begins to dry out, water will be drawn up the wick into the pot through a process called capillary action. Refill the saucer with water regularly. After wicking, let the African violet plant repair any damage to its roots by giving it a rest period. Avoid fertilizing the plant for a couple of weeks. The best time to wick African violets is in the fall. You can use liquid fertilizer on your African violet by adding it to the water in the saucer. Never fill the saucer with water higher than the level of the pebbles. African violet roots will rot if left to sit in water. When threading the wicks through the root ball of the African violet use care to do as little damage to the roots as possible. To avoid mineral and salt buildup in your African violet’s soil, give it a bath in warm water once a month.